In 1919, Ireland was plunged into a brutal war of insurgency and counter-insurgency that ripped the country and its population apart. Tasked with terrorising the terrorists, the Auxiliary Division of the RIC blasted their way into Irish history, leaving a legacy of death, hate and destruction in their wake. 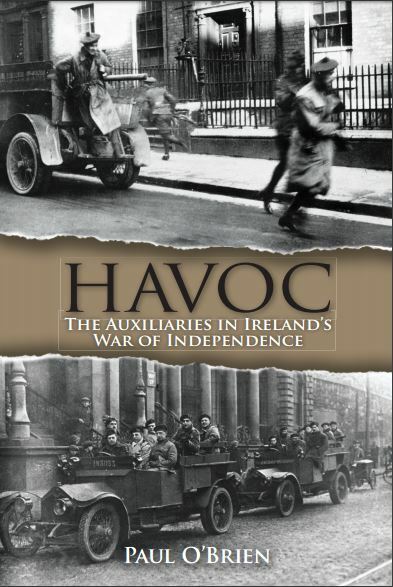 Havoc recounts the story of the Auxiliary Division of the Royal Irish Constabulary, considered by many to be the most notorious police force in the history of the British Isles but overlooked as one of the 20th century’s first specialist forces. As the struggle for Irish independence intensified, Ireland’s regular police force, the Royal Irish Constabulary, bore the brunt of attacks from the Irish Republican Army with hundreds of police officers being killed or maimed in the line of duty. As Ireland descended into chaos, a special paramilitary force of ex-officers with military experience was raised to combat the escalating insurgency. Formed at the personal insistence of Winston Churchill and acceded within the corridors of Parliament, the Auxiliary Division of the Royal Irish Constabulary acquired a formidable reputation as tough, fearless soldiers that did not expect or grant quarter in battle. Utilising their military training and experiences that they had gained during the Great War, they launched a counter-insurgency campaign and were deployed into areas where the IRA was most active. The total number of operatives that served within the Division numbered just over 2,000 with only 1,500 serving at any given time. For twelve months, isolated and often operating under austere conditions, the Division fought a bloody counterinsurgency war against the IRA and its supporters. As the insurgency intensified, the Auxiliaries responded to guerrilla style attacks with increased ferocity resulting in extrajudicial killings, black operations and the wanton destruction of property that included towns and villages. Hated by their enemies and despised by the general population, the Auxiliaries fought against overwhelming odds not only on the battlefield but also within the corridors of power. Twelve months of havoc ensured them a place in the annals of Irish history and a legacy that is still evident today.